web copy, brochures, product descriptions, presentations, press releases, internal communications documents and case studies. Basically, different copy writing projects require different copywriting skills. Whereas agency copywriters tend to focus on one particular type of copywriting – marketing agencies, public relations agencies, account handlers – freelance copywriters often take on a broad range of projects and subject matters. This means agency copywriters often specialise in a particular type of copywriting, which they stick with; and freelance copywriters gain a broad, but arguably less in-depth knowledge of numerous sectors. The upside to working on a variety of projects means freelance copywriters are quick to grasp their client’s requirements. They are also often ex-agency copywriters, former publishers or ex-journalists (as I am). Obviously each of these backgrounds carries with it different strengths, so it’s important to think about what kind of copywriting you want before you choose a copywriter. If it’s advertising copy you want then go with someone who has advertising experience – someone who is used to writing copy aimed at selling something. Having said this, by the nature of their skills base, most copywriters can adapt their writing to any genre. 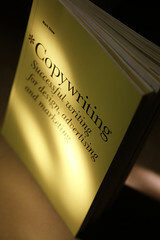 In fact, any copywriter worth his or her salt should be able to to write for any market. back to main Public Speaking And Addressing The MediaWikiLeaks – A New Brand Of Journalism?